Windsor Castle: Steeped in history, Windsor Castle perches proudly on a lush wooded hill overlooking the Thames. Dating back to Norman times, with sweeping landscaped gardens and turreted Round Tower, it’s easy to see why it’s the Queen’s favourite weekend residence. Enjoy a fascinating through–the–keyhole peek at the lavish State Apartments, home to priceless artworks by Rembrandt and Leonardo da Vinci, and visit St. George’s Chapel, the atmospheric final resting place of former monarchs including Henry VIII. You can visit Queen Mary’s Dolls’ House, a truly incredible structure complete with working lifts, running water, electricity and wine bottles, all in miniature! Mysterious Stonehenge: The true meaning of this ancient, awe-inspiring creation has been lost in the mists of time. 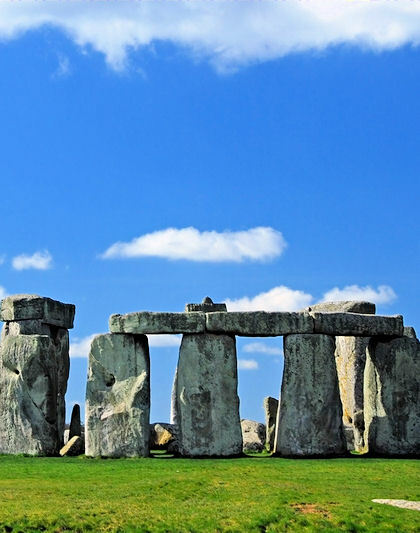 Was Stonehenge a temple for sun worship, a healing centre, a burial site or perhaps a huge calendar? How did our ancestors manage to carry the mighty stones from so far away and then, using only the most primitive of tools, build this amazing structure? Surrounded by mystery, Stonehenge never fails to impress. Bath: Standing proudly on the slopes of the River Avon, beautiful Bath was the first city in England to be designated an UNESCO World Heritage site. The gorgeous 15th century Bath Abbey, the stunning Georgian architecture, the romantic Pulteney Bridge, modeled on Florence's Ponte Vecchio, are all sights to linger on in the memory of your day. Roman Baths and Pump Rooms: No tour of Bath would be complete without a visit to the famous Roman Baths that gave the city its name. This beautifully preserved bathing complex still flows with water from Britain’s only hot spring. Marvel at the dazzling torch–lighting ceremony as dusk falls (not applicable in summer) and sip Bath’s healing waters in the Pump Room, a stunning neo–classical salon. Don't forget to bring your camera. Excursions listed for a port may not be available for every cruise.